All things bright and beautiful: Happy Valentine's Day! I'm so in love with being in love and loving my kids! I know.. too much chocolate! Anyway, I joined two challenges and made these 2 LOs. One about our anniversary and the other about the consequences of marriage. I used Making Memories papers on both of the LOs. 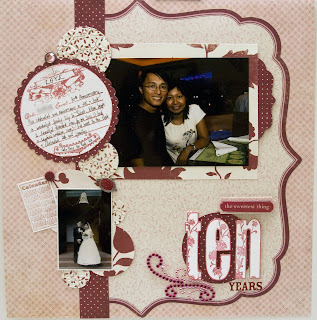 I actually used the Paperie collection on the anniversary LO. I thought I would use it for Christmas, but then when I saw the pics, I thought a red and white colour scheme will do well in the love theme. 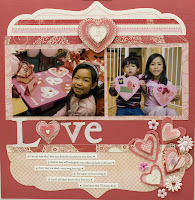 I based this LO off of a sketch found in the Oct, 08 issue of Scrapbook Etc. 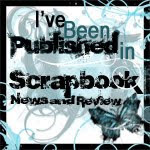 I usually don't scraplift, but this challenge requires it... and I have fun doing it. It is a wonderful sketch and I made some changes to the LO. 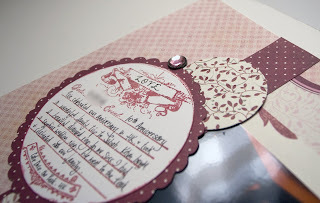 I used the Slice to make the circles and the journaling spot (got to love the Noteworthy Slice Card)! I used a Fancy Pants journaling stamp as well. In order to match the tones of this LO, I stamped the title using the beautiful Technique Tuesday Big Timber Meadow stamps. 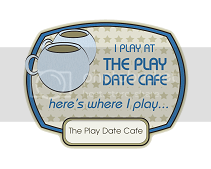 I stamped the title twice and cut and layered with foam stickers to achieve the 3-D feel. This picture was taken on our 10th anniversary, at Cafe Deco at the Peak. There is a hidden pic with us and our kids. We have arrived at the 10th year mark with 2 wonderful gifts. :) The small pic is from our wedding. I just know I'll always do"
I read every book about taking care of babies, but none talks about how to start loving you both. When you were born, I realize it is NOT a conscious decision. It just happens. Just like that. Like I was just programmed to do it, without questioning. The pictures were taken last year, and everything in the pictures, I hand made. My daughter's teacher had a special V-day party for the class and let all the moms came in a day early to decorate each kid's desk. 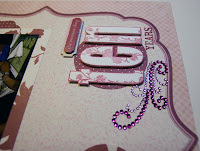 I used my scrapping supplies, of course, and my die cut machine and stickles. :) I also made 2 cards for my kids, with the help of all family members. I used Making Memories' Love Notes line in this LO. I had fun making my own heart embellies. I used the Slice to cut the layers, stickled them and glued them together. The title are acrylic words (Garden Party), but I painted them white.